I’m reluctant to quote statistical data linking patronage of fast food chains to high obesity rates; so much material is circumstantial, biased, and, therefore, skewed. I kid, I kid. But, seriously, when googling information regarding this topic, press quoting U-M studies that link fast food to obesity rates are the first to appear on my screen. 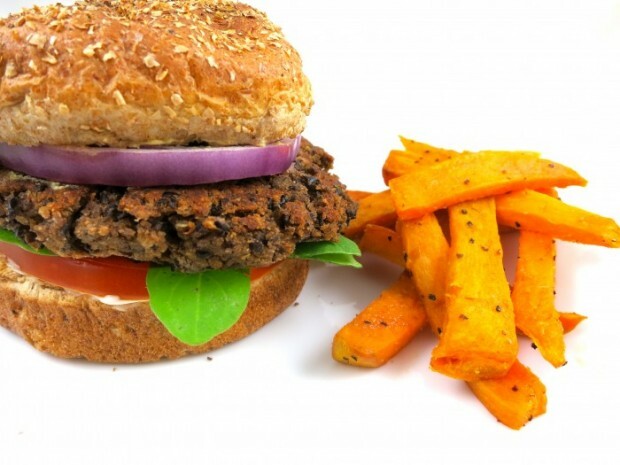 Using this definition in Ann Arbor, you’ll find several healthy fast food eating options. Therefore, I further define fast food as inexpensive food that can also be ordered from a car and eaten in a car. And you won’t find their ingredients listed on the Mediterranean pyramid, unless you consider ketchup a vegetable. Rehydrated wild mushrooms contribute to the meaty flavor profile. Whatever your definition, Americans chow down a heck of a lot of burgers, fries and shakes. And as global markets flatten, other nations are catching up. One can understand the allure. When you’re hungry, on a budget, and too exhausted to cook, the myriad of ready made meals dotting thoroughfares are tempting. And you can dump me and Richard into those fast food stats; we never seem to find time to pack that bento box with soba noodles and edamame to enjoy on our drives up I-75. I can hear, smell and taste the backfire from those car emissions now: bleck! Staring at bugs splattered across a windshield while inhaling a burger that sacrificed our planetary rain forests? How consummately ungreen. So why can’t inexpensive fast food be healthier? And if some chain does manage to whip up a nutritionally sound menu, would we eat it? These are questions Mark Bittman posed in a recent New York Times article. I encourage you to read his insightful musings.The take-away, for me, is yes, we’d eat healthy fast food if it hit the sweet spot, that sweet spot being a real-food meal that tastes good, can be ordered and eaten within 15 minutes, and costs less than 10 bucks. Healthyish options at fast food chains can be found. Burger King, for instance, offers a Morningstar Veggie Burger (410 calories), the eating experience varying as to length of time the patty is microwaved. Sadly, the whole wheat bun they once offered has been replaced with a pillowy white bun — at least at the chains I’ve frequented — but hey, animal welfare issues are silenced. We’re quick to throw blame at fast food restaurants, but when’s the last time you saw someone chained to a golden arch, force-fed a quarter pounder with super-sized fries? A really good veggie burger: Not so fast for the home cook, but so insurmountable for a chain? Mr. Bittman proposes a McBitty’s menu, his take on a healthy, yet affordable, burger, fries and shake, which I recreated in my kitchen. Umami flavors of porcini and soy lend an unctuous meaty flavor to the burger, but the meal took more than an hour to make. Hardly fast. I’m sure, however, some savvy chain could stream-line his prototype — they’d have my bucks and blessing. But if they can’t think outside the bun, can whole grain be an option? (I tweaked quantities in Bittman’s recipe and substituted quiona flakes for the oats. I’ll post the shake and fries recipes on Monday. Soak the mushrooms in hot water for 5 to 10 minutes or until softened; roughly chop. 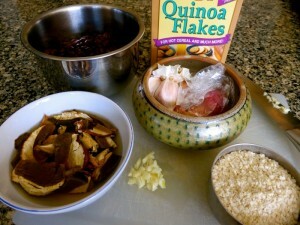 Put the mushrooms, beans, garlic, quinoa flakes, spices and soy sauce in a food processor. Let the machine run until the mixture is combined, not puréed, about 30 seconds. (Or use a potato masher.) Add quinoa flakes to thicken, or liquid to thin, as needed. Stir in cilantro. Put 2 tablespoons oil in a large skillet over medium-low heat. 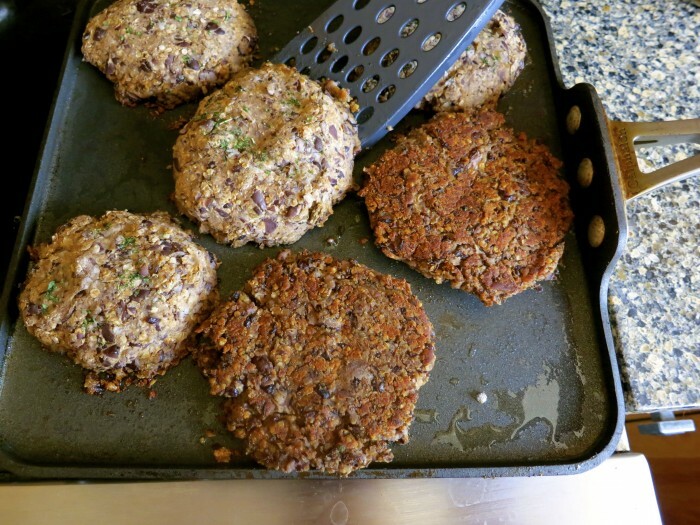 Cook burgers until crisp on one side, about 5 minutes. Flip and cook until they are crisp on the other side, another 5 minutes or so, adding additional oil if needed. Place in buns; pass the condiments.